Judith Flanders's The Invention of Murder on BBC Radio 4. 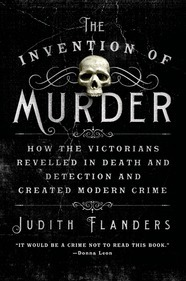 BBC Radio 4's Book of the Week is offering readings of Judith Flanders's The Invention of Murder: How the Victorians Revelled in Death and Detection and Created Modern Crime. I reviewed the book here for the Washington Independent Review of Books. Of related interest: Readings are starting of Kate Summerscale's The Suspicions of Mr. Whicher (on the Constance Kent case). British thriller author Harry Patterson (aka Jack Higgins) turns 86 today. His novel A Candle for the Dead, written under the pseudonym Hugh Marlowe, was adapted as the film The Violent Enemy (1967). An Irish revolutionary (Tom Bell) breaks out of prison, returns home, and faces pressure from his IRA colleague (Ed Begley) to blow up a factory. 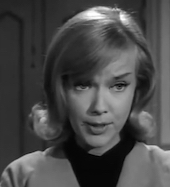 Susan Hampshire costars. The legacy of Joseph Hansen. 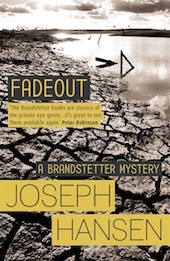 The WOW Report pays tribute to Joseph Hansen (1923–2004), creator of groundbreaking gay investigator Dave Brandstetter. His work includes Fadeout (edited by legendary mystery editor Joan Kahn), The Little Dog Laughed, Shamus nominee Gravedigger, and Lambda winner A Country of Old Men. Among the goodies just uploaded to YouTube by British Movietone is footage from 1932 of Fu Manchu creator Sax Rohmer (aka Arthur Henry Sarsfield Ward) talking about the levels of U.S. versus British crime. Ethel Lina White's Her Heart in Her Throat (1942) was adapted as The Unseen, with July 23rd birthday boy Raymond Chandler as a screenwriter. In The Unseen, governess Gail Russell suspects that nefarious activities are going on in the neighborhood and wonders about the role of her employer, shipbuilder Joel McCrea, in his wife's death. Herbert Marshall and Norman Lloyd costar. 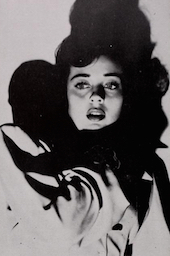 The film, an attempt by director Lewis Allen to follow up The Uninvited (1944, also with Russell), has some echoes of Henry James's "The Turn of the Screw." In their "Whodunit Wednesday" tumblr features, University of North Carolina Greensboro's Special Collections have been highlighting artists who designed Honey West covers that are part of their Robbie Emily Dunn Collection of American Detective Fiction. 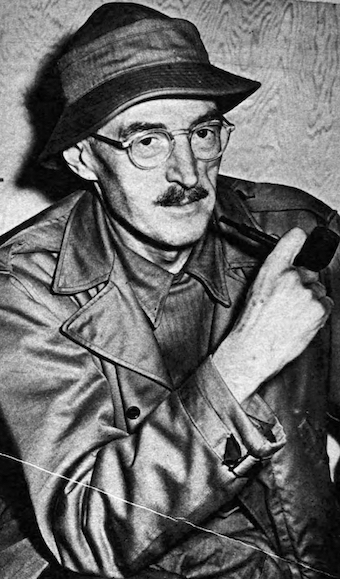 The latest is R.A. Maguire, who created three Honey West covers: Kiss for a Killer, Dig a Dead Doll, and Blood and Honey. There are previous posts on artist Harry Schaare and Honey West author G. G. Fickling (pseudonym of Gloria and Forest Fickling). This 12-minute episode of Playhouse 15 (aka Short Short Dramas) features familiar character actor Henry Jones as a realtor pressured by his wife to kill his business partner for the life insurance payout. New light on codebreaking couple. The NSA has declassified 7000 records of William F. Friedman (1891–1969), a U.S. cryptology pioneer inspired by Edgar Allan Poe, and his wife Elizebeth (1892–1980), also a noted codebreaker. This initiative coincides with exhibitions on the Friedmans by the Marshall Foundation and the National Cryptological Museum. Listen to Friedman's lecture on the Shakespeare ciphers and his 1960 talk about historical efforts in codebreaking (part 1, part 2, part 3). Hammett defies U.S. District Court. Today in 1951, Dashiell Hammett, chair of the Civil Rights Congress' bail committee, refused in New York's US district court to provide the names of those who had posted $80,000 bail for four communists; the latter subsequently failed to appear in court. 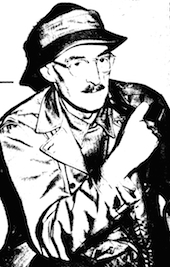 Convicted of contempt of court, Hammett went to prison in Kentucky and was released in December 1951. In O.S.S., Alan Ladd and Geraldine Fitzgerald are two spies engaged in sabotage against the enemy in World War II France. The screenwriter-producer is Richard Maibaum, who wrote many of the screenplays for the James Bond films. 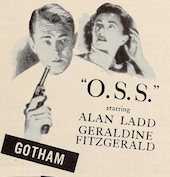 The film's publicity materials ballyhoo the cooperation of the real Office of Strategic Services (precursor to the CIA) in the making of the film. "The Criminal Neglect of Detective Fiction." In the 4 June 2015 Times Higher Education, University of Ulster English professor Richard Bradford wonders why academe treats crime fiction as "worthy of inspection but little respect." Some of the writers mentioned are W. H. Auden, Raymond Chandler, James Ellroy, Patricia Highsmith, Edgar Allan Poe, and Edmund Wilson. 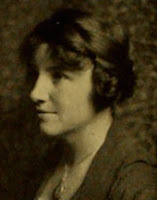 He states that Smith College English professor Marjorie Hope Nicolson was the first to explore the relationship of academics to detective fiction in "The Professor and the Detective" (Atlantic Monthly, Apr 1929, 483–93), but notes that she was fairly dismissive in her piece.